Super Fleas Do Really Exist? If YES! What Can You Do To Stop Them? Fleas are omnipresent. Wherever you want to take your dog in order to flee from the dangers of fleas, there is no place except Antarctic. Therefore, it is no surprise that we have to work a great deal to fight against these insects no matter in what part of the torrid or tropical regions we live in. Moreover, a battle against fleas has become a year round affair. Though summer has been regarded as the peak flea season, there is no room left for mild winter too, along with the central heating system and carpet as well as the damp environment, which led to the breeding of more fleas. With the influx of more and more fleas, year by year, pet parents and pet sitters alike are likely to be more frustrated and animals equally irritated. What is a big deal about these super fleas? Are fleas evolving to be more tolerant to treatments? treatments? or have they evolved to be mutant fleas? Well, some of the studies show – NOT YET! Then who is the real culprit and what is the reason? The secret unveiled is that the fleas are sticking more around into the environment, having a safe haven, and even if they are eliminated off your dog, the root problem seems not been addressed. When you look at the real picture, only 5 % of the flea population lives on a dog. The other 95% comprises of those partying in the crevices of your floor and walls, potted plants, carpets, upholstery, damp places around kitchen sink, garbage bins and the thin linage between the partitions as well as the open yard around your house. They just hang around these shady and moist places and just wait in the dormant state waiting for favorable environment and right position to attack. Seldom, they jump 10-12 inches to get stick to their host. With a good feast on fresh animal blood, fleas become super fleas with that super nourishment. 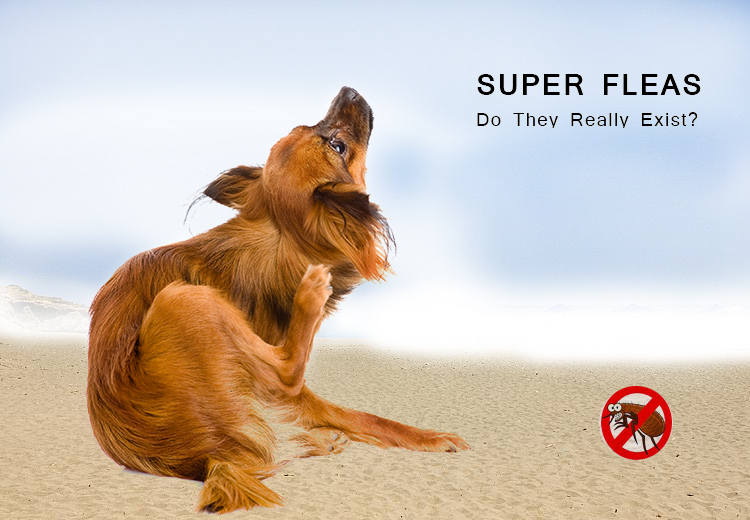 Given better environment and timely blood supply, all fleas can become super fleas. They become stubborn and stick around. So, what a pet parent can do? To be on top of these fleas, stay well acquainted with effective flea treatments year round and be on guard. New flea treatments are evolving with more potent ingredients giving 100% results that you can pick from. Oral flea control products – Capstar, Comfortis and Program tablets. Topical flea control solutions – Frontline Plus, K9 Advantix and Advantage. Whichever, flea treatment you choose, be vigilant that you follow correct instructions on the pack as well as protect your environment from fleas using other yard flea control treatments. A happy dog is directly related to a flea free dog. So, act fastidious to keep your pooch free from fleas.